Disqus offers a range of Moderation tools to help communities deal with antagonistic or spammy posters. Typically, adding users to the Banned User list will ensure that they no longer post at your site. However, with more dedicated troll and spam accounts, additional measures may be necessary to curb their destructive actions. Below is a list of actions and tips to help with toxic commenters, repeat impersonators, dedicated trolls, or any other users you don’t want in your community. When moderating, you'll want to use the Priority Sort filter to surface the most troublesome commenters. This filter uses a special calculation of flags, downvotes, restricted words, reputation, and guest account status to determine which comments will likely need swift action. Priority sort can be found next to the existing “newest” and “oldest” options within the sort menu in the top right navigation of the Moderation panel. After you have identified any users that are breaking your site’s community guidelines, we recommend taking action on their accounts. As a moderator of the forum, the most important step is usually banning culprit email address since that is the central identifier used for accounts in our system. This prevents the user from creating a new account using the same email address. Similarly, you can consider banning the IP address. This can be helpful when you know that multiple users are using the same IP address, but different email addresses. If the unwanted content or users continue to be a problem in your community, you may want to turn on the pre-Moderation setting for all users, which will require all posts to be explicitly approved by a moderator before appearing on the page, with the exception of users who have been added to the Trusted User list. For more active sites, we recommend adding your most trusted and frequent commenters to the trusted User list, so that moderators can spend more time reviewing comments from new users or more troublesome accounts. Add accounts to your Trusted User list in Community → Banned Users → Trusted. It’s even possible to programmatically add and remove trusted/banned users using the API if you have data like “subscribers” on your site’s end that you’d like to pass to Disqus (see the blacklists and whitelists endpoints). For ideas on who to add to your trusted user list, view your site’s top commenters in your site’s community profile at https://disqus.com/home/forum/[FORUM_SHORTNAME]/commenters/ or in your Engage Analytics at Community → Top Comments. After making use of the Trusted User list, you can consider toggling the pre-moderation setting to “All”. This will ensure that all comments will require moderation, with exception to your trusted users’ comments which will become approved immediately. Lower the flagging threshold so that comments which are flagged X number of times are removed from public view. This can help your community moderators by allowing your users to surface and hide comments most in need of moderation. The flag settings may be adjusted at Settings → Moderation → Flagged Comments. If you have identified any recurring spammy URLs or words in these comments, you can add those strings of text to your forum's Restricted Words list. Any comment containing one of these strings, for example "money.net/click", will be automatically placed in the Pending filter and will require moderator approval before it is public. 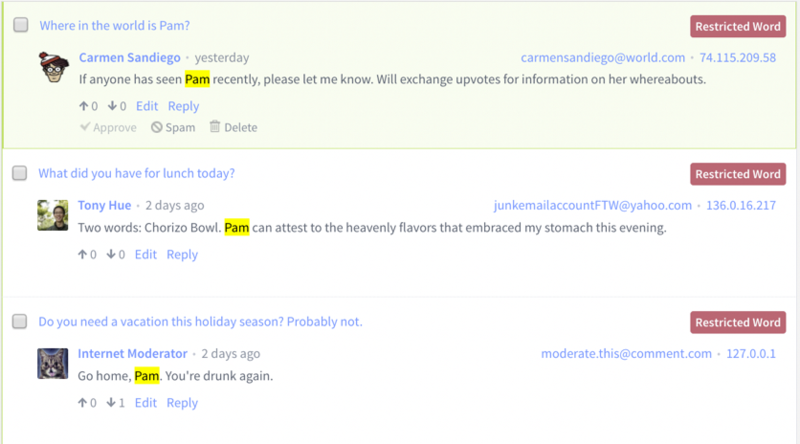 When comments are posted containing a Restricted Word, that word will be highlighted in the Pending filter. Learn more about how to use the Restricted Word list effectively. In Disqus, accounts must use unique usernames (which appear in the URL of their profile), but are allowed to use the same display name, so that two users named Bob may have just “Bob” appear on their profiles and could be distinguished by their account avatars. Impersonation occurs when one user maliciously copies both the display name and avatar of another account, making their copy account indistinguishable in order to post false content. In general, we recommend that Impersonating accounts be added to the Banned User list to prevent them from further posting to the site. If they continue to create new impersonating accounts, the Restricted word function can be used in conjunction with the Trusted User list to combat repeated impersonation. The Trusted User list will override the Restricted word filter, a Moderator may add the original community member to the Trusted User list, to ensure that their comments will appear successfully on the site. If the display of the account is also added to the Restricted Word filter, this will cause comments from all other accounts besides the original account to be set to Pending, requiring explicit moderator approval before showing publicly. This will allow moderators to stop all impersonating comments from appearing publicly on the site. To implement this, you may add the display name being copied to your Restricted Word filter, and add the original user that is being impersonated to your Trusted User list. This will allow the original user to post successfully without moderation, and will set all comments from other accounts using that exact name as Pending until they've been explicitly approved by a moderator. Adding more moderators will make moderation faster and more comprehensive across your community. Encourage moderators to be more active in the community by commenting regularly. Having your moderators participate in your own community is one of the best ways to grow engagement, set examples for your community, and have a stronger moderation presence. Learn more about getting your authors and moderators involved in the comments section. Community guidelines are a place for you to set the tone of your community and lay a foundation for what is acceptable. This can be communicated to commenters by adding visible community guidelines to your site's HTML, directly above the Disqus embed. More information, see our 4 Best Practices for Integrating Community Guidelines in your Site. Consider turning on automatic closing. This feature closes threads after a set amount of days which can help your moderation team focus on recent articles only. Recent articles are most likely to be where the highest volume of traffic and engagement is likely to be occurring. Consider disabling “Allow guests to comment” if your goal is to tighten control over the quality of comments that you receive. Guest comments sometimes require closer moderation. If you’re more concerned about receiving higher volumes of comments, you can leave the setting as you have it. More information here.